David Lendrum is an unusual man. I have known him for thirty years and what remains extraordinary is his love of art. This is everywhere in evidence; in his home, in his personal collection, in his library. His taste is impeccable and particular. His heroes are the painterly, colourful Hans Hofmann, and Paul Cézanne. It is fair to say his life is lived for art. I know myself that this love can be both a blessing and a curse. History informs, inspires, but also presents challenges and expectations of success in artistic terms that can seem an insurmountable barrier, a burden to personal achievement in the here and now. I was delighted to find upon visiting David Lendrum’s studio that the latter was not the case, and that his work is at a very exciting stage in its development. 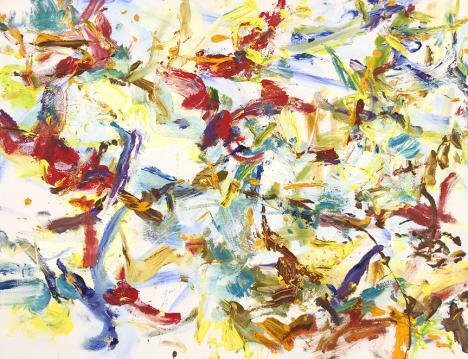 Like all good artists he is open to new influences, and he may now be looking at work slightly outside his pantheon, toward late Willem de Kooning and Patrick Heron’s white paintings. To explain his procedure is to say that he works on medium-sized stretched and primed canvases of a squarish rectangle. These he “attacks” with a variety of loaded brushes. “Attacks” is relevant because the marks are charged with energy and velocity, and seem to skim across the surface. Rather than the existential gravitas of Abstract Expressionism, there is a feeling of depth and surface akin to Monet’s Waterlilies, which Lendrum has felt the influence of in earlier canvases. In his best works the marks suggest a space much larger than the container of the canvas shape. Lendrum starts with larger dry and dragged cooler hues; the space advances in colour waves and it seems to me this is his area of strength. His colour choices and avoidance of tonal clustering gives the paintings an enormous sense of vitality. I am sure this is what he is after – excitement, velocity and emotional resonance. He has stated to me that he wishes the structure to be inherent in the marks. He wants the colours (complementaries) to reflect light across the surface. All this he achieves. One would think that such an adventurous process would guarantee excitement, but not so, as anyone who has tried it will know. Our innate need for balance and order causes the eye and brain to search for connections between rhythms and clusters of marks and colours, whether or not they are intended. This rationality and ordering is exactly what Lendrum strives to go beyond. There is an argument which says that abstract painting needs a long apprenticeship. Lendrum has been unusually thorough in his studying. That he is now, in his late fifties, throwing caution to the wind, mirrors his hero Hofmann, whose work blossomed when, late in life, he stopped teaching, closed his school and concentrated on painting. Lendrum’s achievement, which is clearly apparent in his new work, is down to nerve, flair and rejection of a doctrinaire approach. Every smudge, drip and scattering of lacunae actually brings him closer to something essential which exists in Jackson Pollock’s mature works. Pollock stated that “I am nature”, and it strikes me that Lendrum is moving away from Monet and the way painting reproduced nature, to a more inward assessment. Lendrum’s studio is located in one of those industrial buildings reminiscent of the Eastern bloc. There is no room for dissemblance when you get there, just a large white cube with metal windows. The only view is the tangle of vegetation that provides wildlife refuge in the Metropolis. Lendrum referrs to this as a stimulus for colour. The locality is harsh; scaffolding yards, garages and industrial waste. The glamour of the art-world seems miles away, with its back turned. Lendrum certainly possesses the stoicism to weather changes in fashion, and yet one senses an erupting warmth, a generosity and a real wish to communicate and share his pleasure. He is daily in the process of throwing away crutches – being careful as he has said “not to throw the baby out with the bathwater”. I am fascinated to see where Lendrum’s work moves next, for he is an artist going places, and I am sure there is more experimentation and resolution to come.